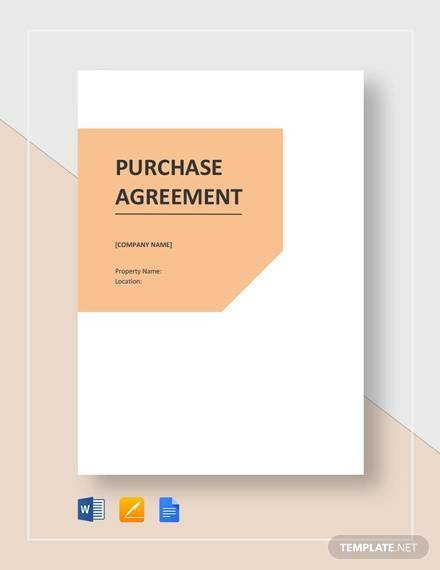 This legal contract, common in almost all kinds of businesses, obligates the buyer to make the Sample Purchase Agreement Templates , and the seller to sell it, be it a product or a service. 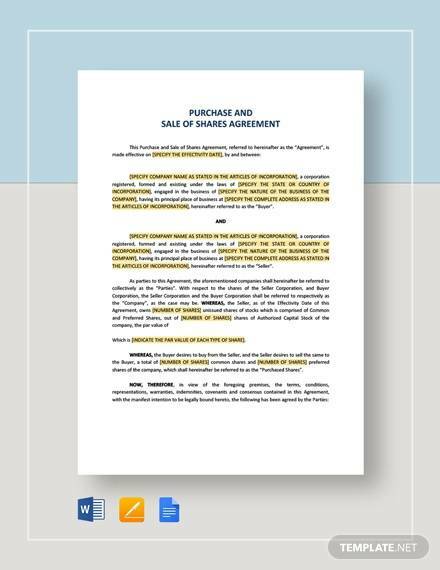 In fact, purchase and sale agreements can even be used in the purchase and sale of companies, in accordance with the terms initially stipulated in the letter of intent. The vehicle purchase and sale agreement starts with mentioning the date of purchase of the particular vehicle. It then contains the full names of the buyer and seller. 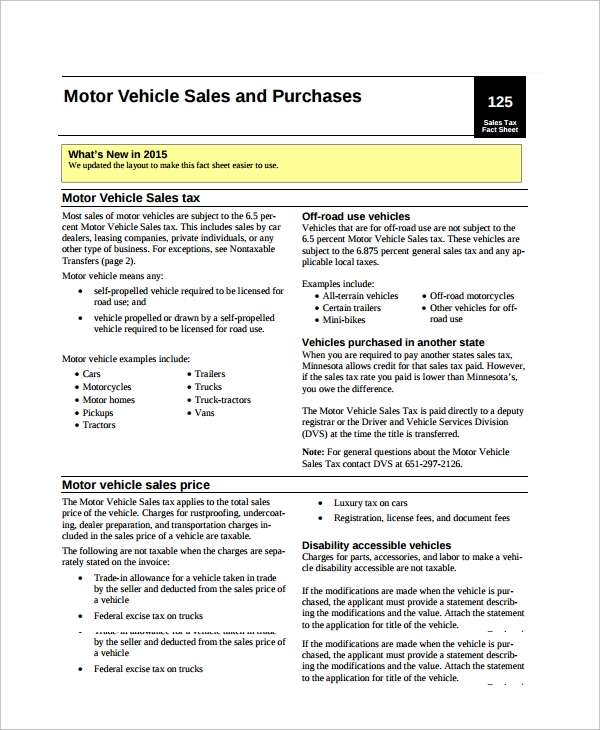 The terms and conditions are mentioned later which include a complete description of the acquired vehicle (model, colour, year, miles and vehicle identification number). The terms and conditions also include delivery details. 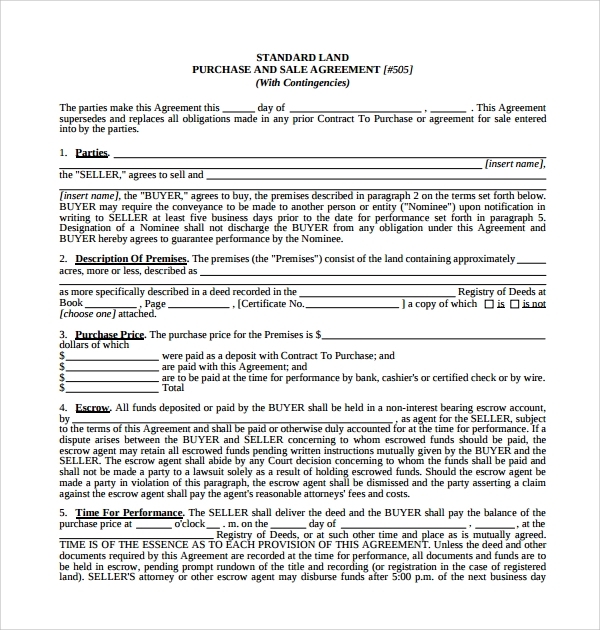 Placed at the end of the agreement is the signature of the seller and buyer for authentication and confirmation. 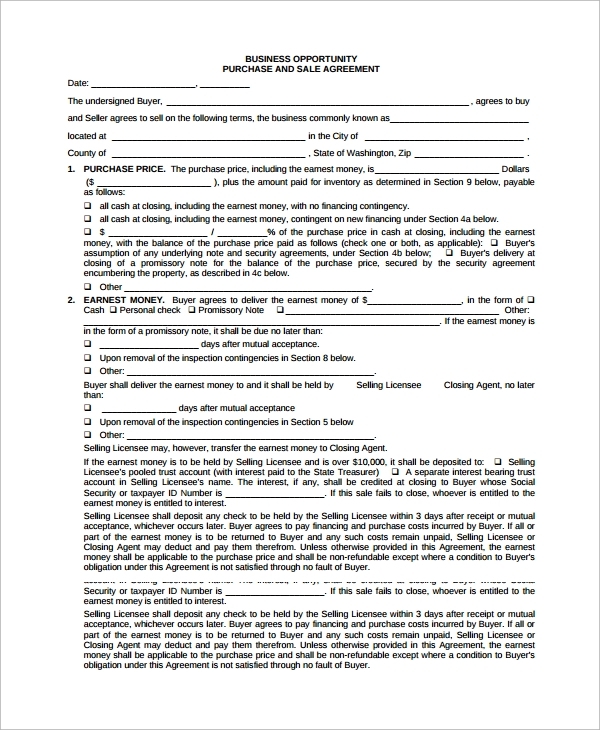 This template of the purchase and sale agreement asks for the Name of the Buyer, Name of the Seller, Address of the real estate being sold, the exact price of the land in rupees and the Earnest money which refers to the money paid to confirm a contract. 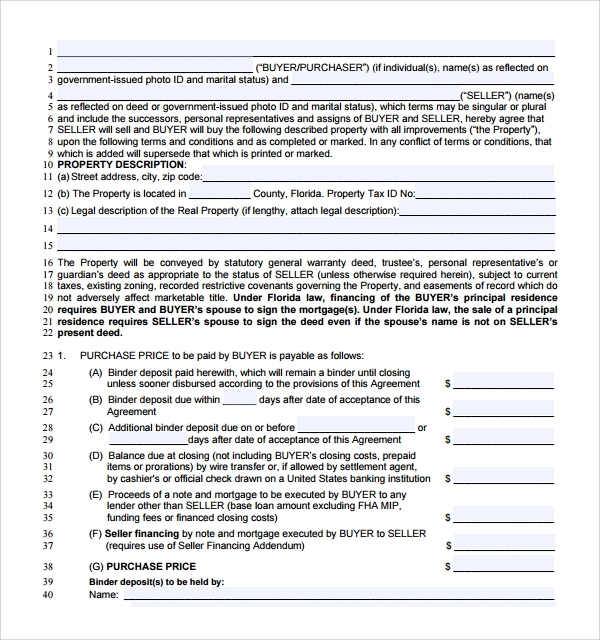 The agreement further asks for the date of closing and expiration. The later part of the agreement contains the information of items included in the taxes and also the home protection plans. This particular agreement could be used for the purpose of transaction of every product. 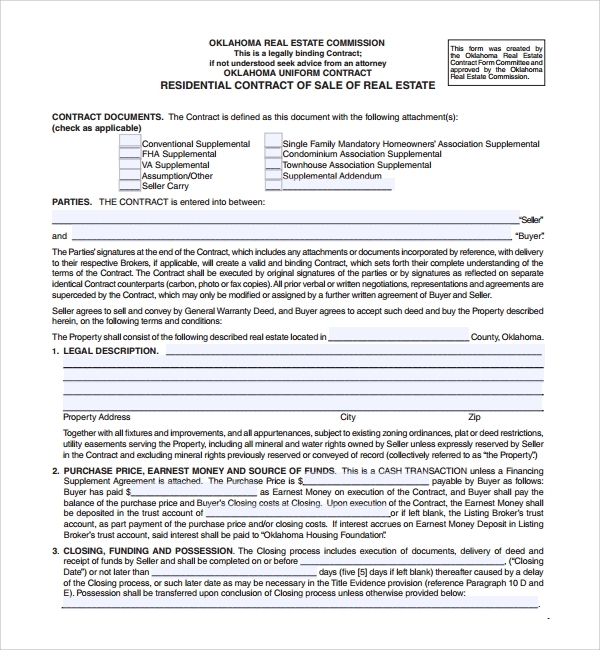 It begins with the details of the buyer and seller that include their Names and address. It further asks the title of the product under the transaction. The latter part of the agreement contains the details of the Purchase Price, Mortgage Contingencies, Fixtures and other personal Property. 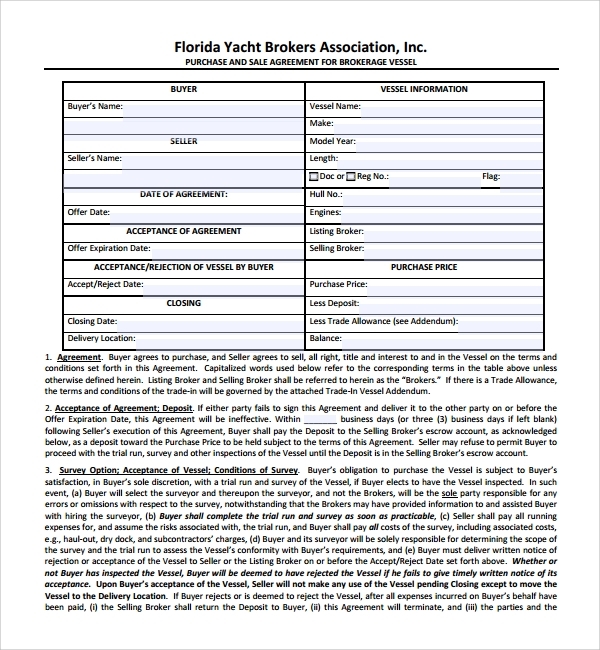 Finally, the signature and date of the signature are required to complete the contract and make it valid. 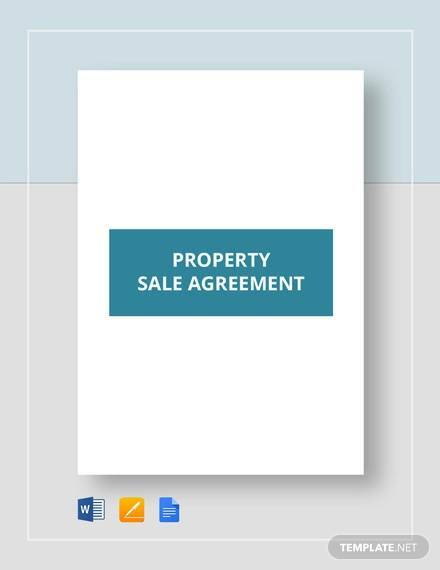 As you will be able to see from these samples, purchase and sale agreements usually have the following characteristics, summed up below. They are frequently used in large and publicly-traded companies, specifically in the upper supply chains. They aid both the purchasers and the suppliers in terms of forecasting cost and demand. The greater the size of the deal, the more important the purchase and becomes, which is exactly why these examples might come in handy. 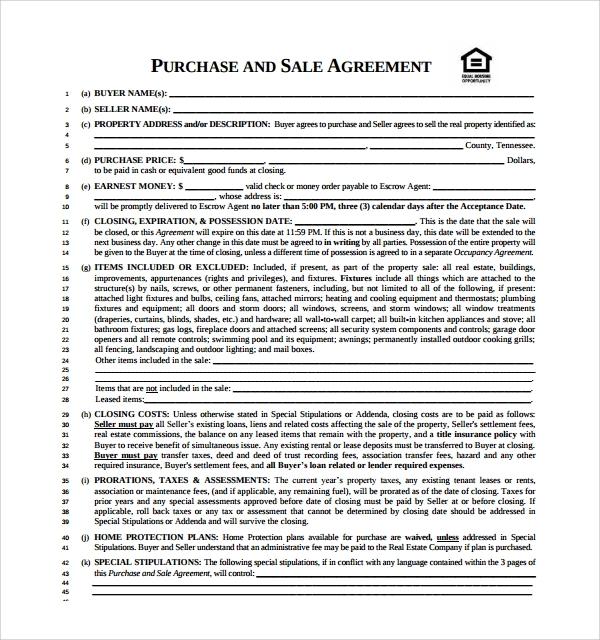 The purchase and sale agreement is generally a pretty lengthy document. While certain sections would definitely vary from transaction to transaction, you will find that most templates will definitely contain the following. Legal names and addresses of parties involved, definition of business terms used, specification of the kind of transaction. Purchase price and adjustments to the same, terms of payment, long term liabilities assumed (if any) and post closing rights and obligations. Warranties and protocol for dispute resolution. 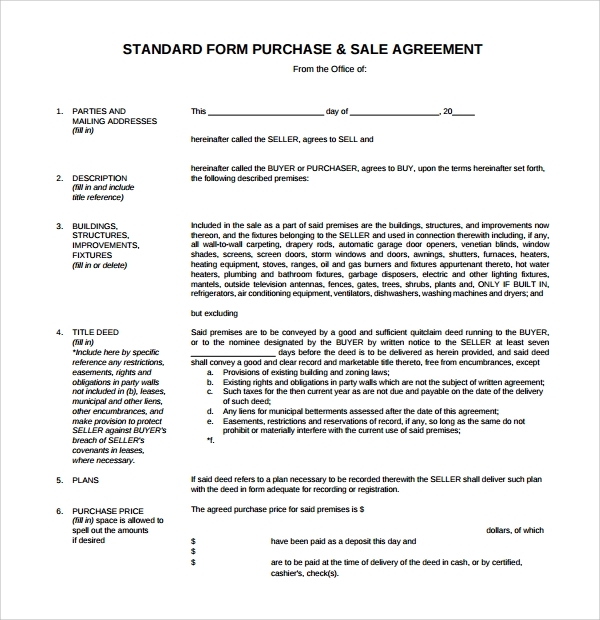 When making a small sale or purchase, the purchase and sale agreement is not an absolute must. When the commodity changing hands is a major asset or even a company, however, documentation of every aspect of the transaction is a necessity. A perusal of these templates will provide you with a guideline. 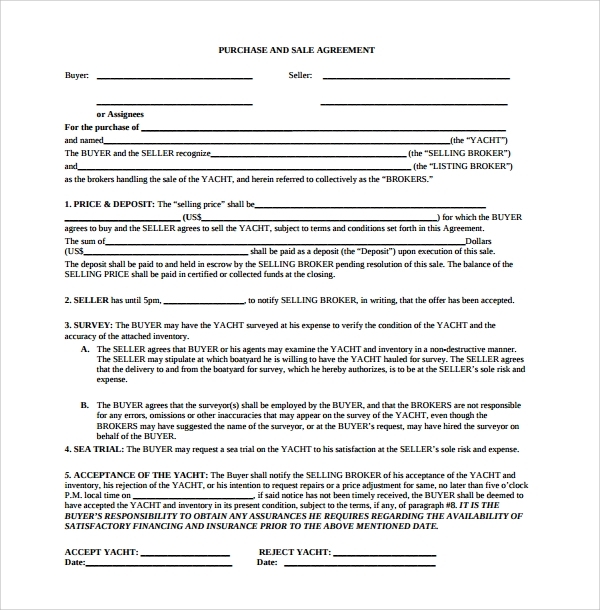 You may like Business Purchase Agreements. The terms and conditions cannot be violated by either party. Without the consent of the other party, one cannot change the terms of the contract. Any violation can lead to consequences. 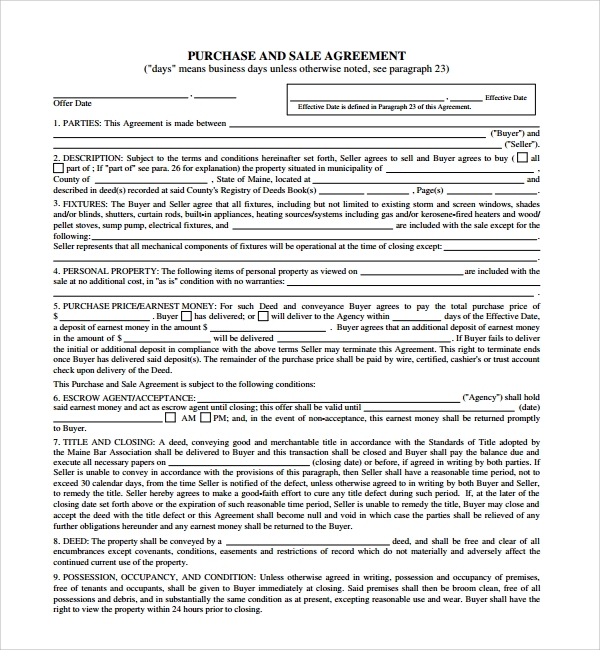 The authenticity of the contract may require additional proofs and tests. 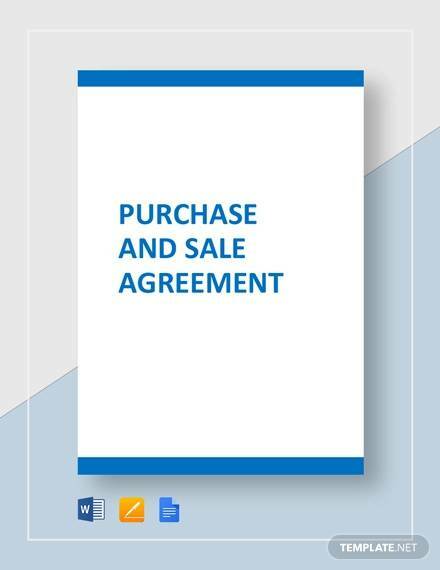 The purchase and sales agreements serve an important role in the economy. Most of the big transactions such as real estate and vehicle purchase require this paper of authentication. 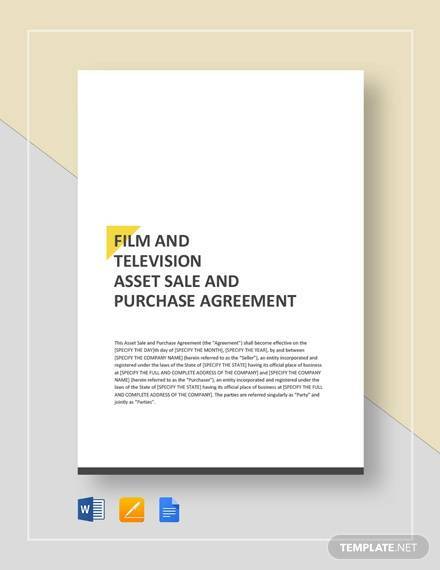 The agreement lays down foundations and behavior and rules that must be pertained to avoid any misunderstanding, unlawful action or harassment. It provides the details of the commodity and of the sellers as well as the buyers who are equally responsible and can be questioned during verification. It provides the identity of possession for the buyer. The agreement is absolute and is legal proof of lawful possession and trade. This helps to track economic and financial activities and maintain the records of the same. You can also see Commercial Purchase Agreements. 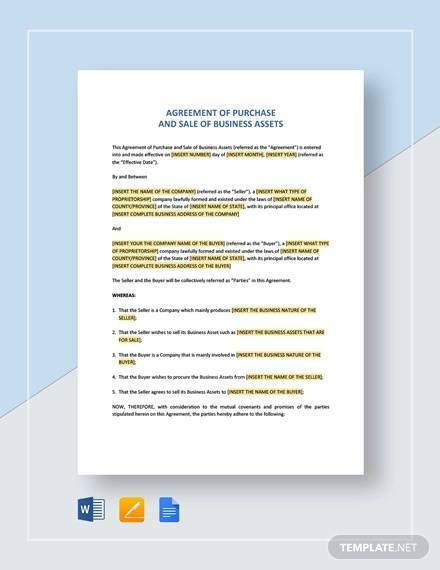 The Purchase and sales agreement can be used in the field of land purchase, house purchase, vehicle purchase, precious stones or jewelry purchase, real estate purchase, farmland purchase, yacht or ship purchase, purchase of companies or businesses along with the factories and work areas. 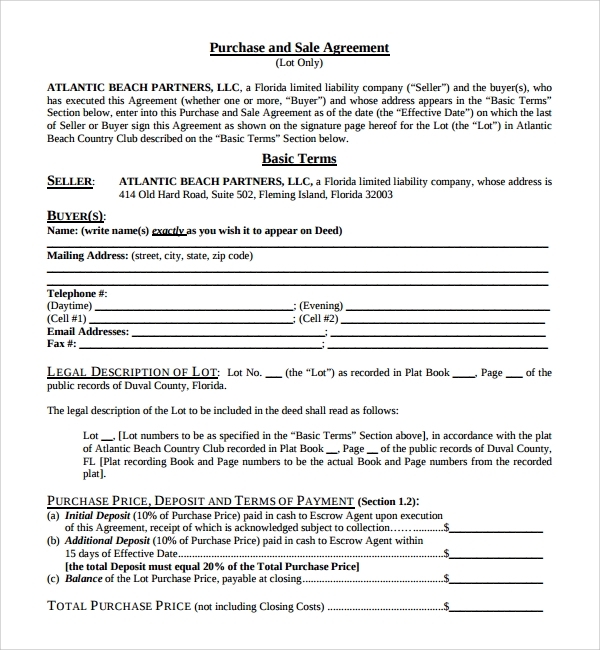 Each of the major transactions of a place needs a purchase and sale agreement that records the event of the respected transaction. This helps to understand the terms of the deed and also avoid confusion when it comes to the included items in the purchase. 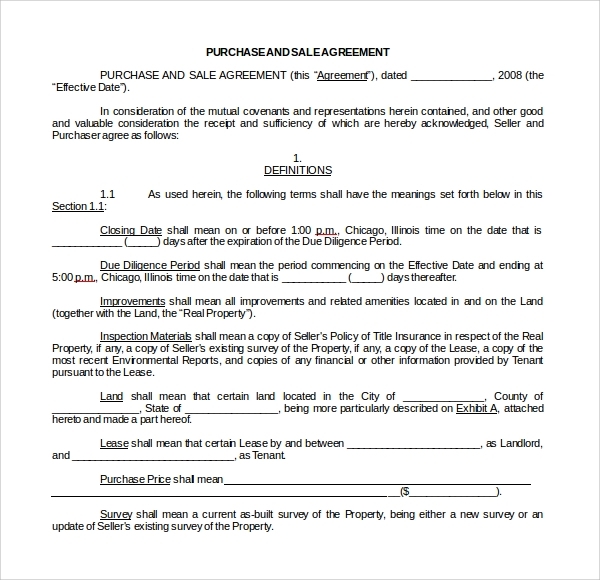 Deals need to be specific and in real estate transactions, one must mention the items included in the deal. 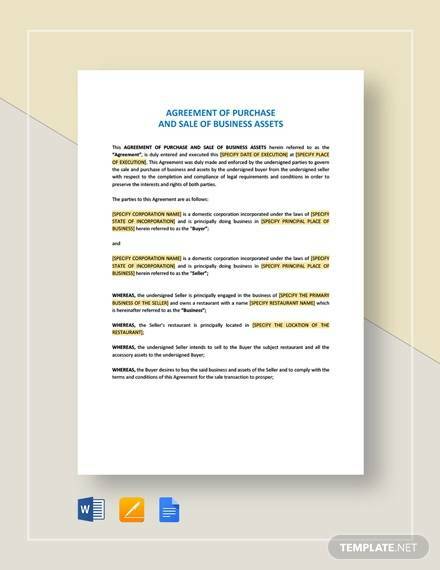 The purchase and sale agreement can act as major managerial benefits by providing transaction and financial records of a company or an individual. It has various procedures to be followed and has immense importance in the legal aspect. Many times this agreement can be manipulated and used to destroy one of the parties.